Wow! What a summer in Italy! It was an incredibly life-changing experience that I would encourage anyone and everyone to do. It helped bring out my independence, flexibility, and adaptability, which are all great qualities to learn and develop while one is college so that one can utilize them in the professional world. Returning to America has been difficult because the environment and culture was extremely laid back. The culture shock of having to be back on a strict schedule with stress was definitely challenging, but going back to school has assisted in that transition. On a positive note, returning to air condition or “aria conditionale” (a description I hunted for in picking a restaurant for dinner in Italy) was one of the most glorious feelings. I have never been so thankful for an American commodity like AC and living abroad for so long really helped me see the small things I take for granted everyday. 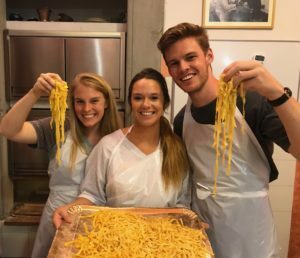 Sharing my experience with my friends and family has sometimes been tough to put into words and it is even hard for me to formulate words about how much I loved studying abroad. The only thing I can write is GO. If you ever have the opportunity, make it work financially and study abroad. It will be one of the best and most influential decisions you could ever make.